We have had the best month over the winter period in terms of jobs completed, plan executed and positive feedback from the members. Firstly we had a meeting on the 3/3/15 with kath Bentley from the S.T.R.I, she was very encouraged from what she saw, both on the course and the plan we have going forward. Her concerns were still on reducing the thatch layer, and thankfully our plan is fully focused on this. Kath has suggested that we target the localised wetter areas on some greens, this was amended to the plan and will go into detail further in this report. She stressed that the removal of thatch is imperative to us moving forward with the putting surfaces. The greens were hand cut 6 times at 6mm, they were verti drained to 200mm and also penciled tined to 75mm. Twice this month we have been able to get topdressing on the greens, firstly we put a tonne of kiln dried sand on with the fertilizer spreader, this was concentrated on the wetter areas (I.e. Back left 4th), we also got 4 tonnes on with the large dresser. This was done after the verti draining, so hopefully some sand got down deep into the profile. 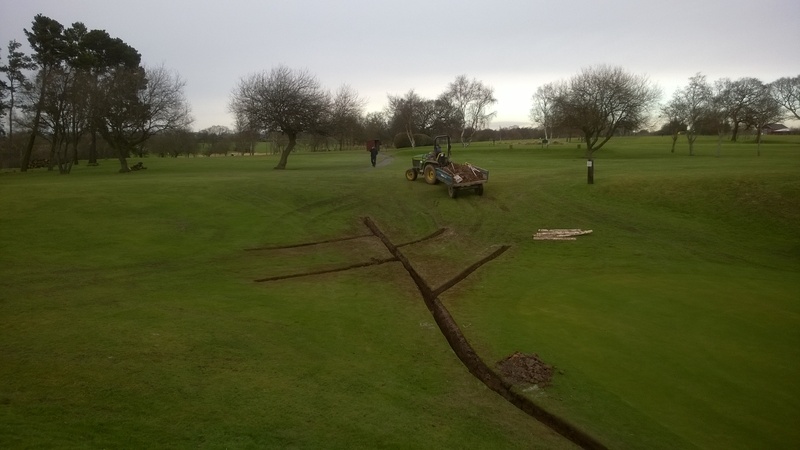 The 3 drainage jobs that we had started in January were completed, all the drainage channels were turfed. Thanks for keeping off these areas, all these areas should be back in play before the start of the season. 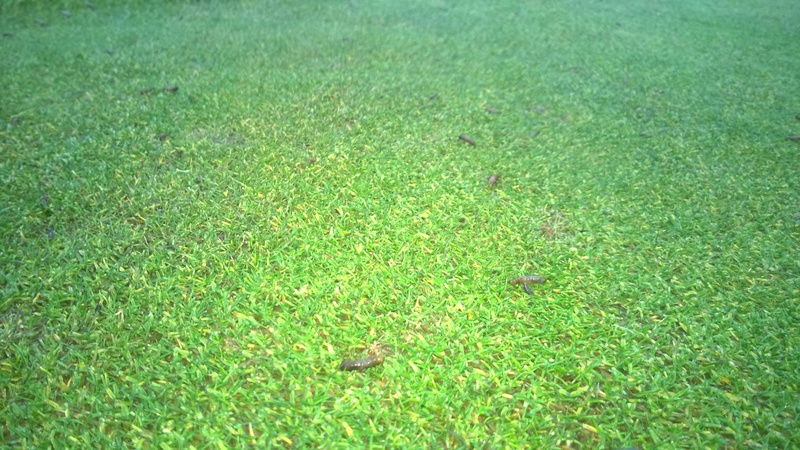 The greens were sprayed with an insecticide treatment, this was because we saw signs of bird damage on the greens. The birds were pecking the turf in search of ‘leather jackets’. Leather jackets are the larva of Crane flies, they lay their eggs in the turf in late autumn, it was a really bad year for us because of the mild temperatures all autumn/ winter, if you remember back there were hundreds on the clubhouse windows. They are tiny worm like creatures. The two problems associated with leather jackets are that firstly, they live and feed on the grass roots, causing the turf to struggle and possibly die. Secondly birds hunt them, they peck at the turf, pulling out chunks to get to these pests. As the pictures show the problem should be over! A third application of Rocastem (Penetrant wetting agent) was applied to the green. I think we are seeing the results of our winter wetting agent programme. Moisture results taken on the 5th of march show that on average the greens are 10% drier than when they were tested last april, hopefully by april they will be closer to 15-20% drier than the previous year. This month is a massive month for us, major aeration work will take place to hopefully reduce the thatch layer in the greens giving us a drier/ firmer surface. Firstly a 8-0-16 +2%Mg+4%Fe will be applied mid/ late next week. This will get the greens in a healthy state prior the next phase. We intend to micro-core the wetter areas of some greens first (i.e. front 1st, back left 4th, front 6th etc) areas that are prone to hold water. We will then go over the area with the verti-drain to a depth of 300mm. The greens will then be heavily dressed with 10 tonnes of sand dressing. The week after we will just verti-drain these areas, followed by the heavy dressing. The week after that we will go back to what we did in the first week (core, VD, dress). Unfortunately during this major surgery the greens will suffer slightly, due to use causing the surface to become unstable by taking out thatch. Everything will be done to get the surface back asap, plans are already in place on order of works and what is needed after. The work will mainly be carried out on mon/tues, giving us plenty of time in the rest of the week to get the surface back. Works like this is essential to the progression of the greens. Please follow us on twitter @ashtonleagreens, we do daily updates and also put on a few pics of jobs. We’ve identified the problem areas on the greens, then we prioritised them into what needs to be done first. Once we’d completed the worst two areas (1st green, 13th approach) we moved onto the 3rd green, the very front portion. The front part of the green was a problem area, causing the green to be off many times due to holding onto moisture. 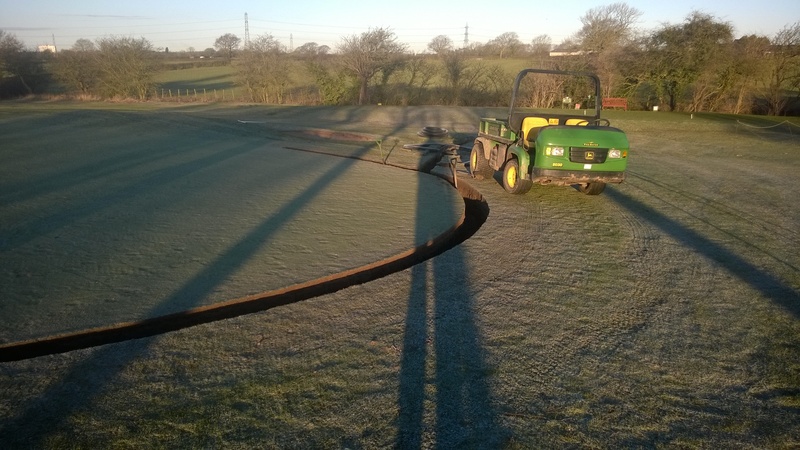 The plan was to install over 50m of pipe, a drain running around the front then off down the hill to be collected in a carry away drain beside the 4th green, a lateral from on the green would also run into the system. The way we complete the task is a little different than you would in your back garden due to the quality of the materials we use. 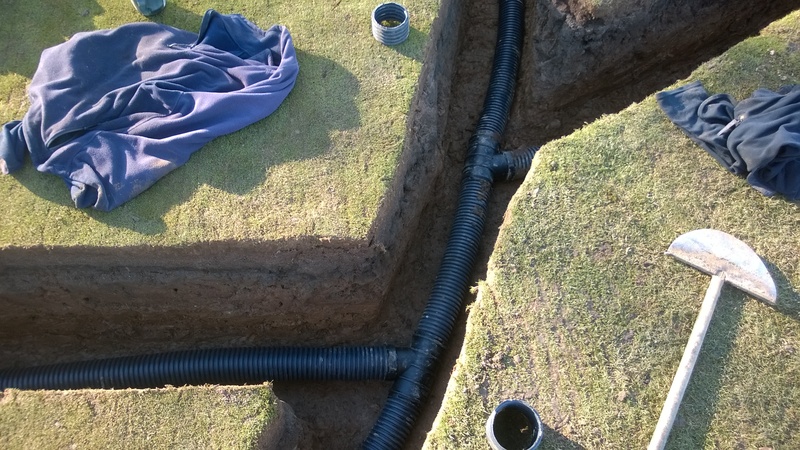 We use a 2 tier system, where we have 6mm stone placed over the pipe with rootzone then placed directly onto the drainage stone. The way you would carry out the task in your garden would be to use 10-20mm limestone, then place a membrane to stop the soil migrating into the stone. The drains are 600mm deep (all hand dug! ), the pipe is 100mm. 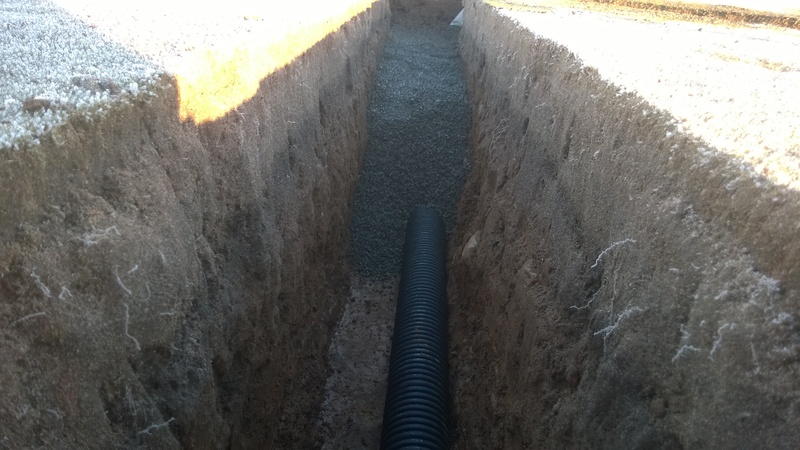 The pipe is installed then the 6mm drainage stone is placed up to 300mm from the surface. 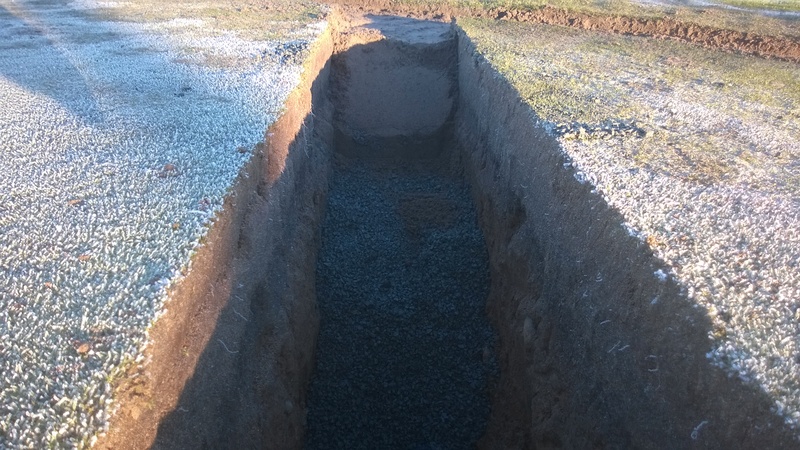 Rootzone is then placed on top of the drainage stone to within mm’s of the surface, this allows up to place turf taken from the 7th nursery green on to the new trenches. We did exactly the same on the 1st & 13th. We are hoping to complete small tasks on the 4th & 10th green to improve the putting surfaces. Having given you an email to outline my intentions for the greens this winter I will go through what we have been able to complete. Aeration is the biggest task we have over winter, to keep the surface open to allow water to get through the soil profile as quickly as possible. We completed 5 aeration procedures during November. 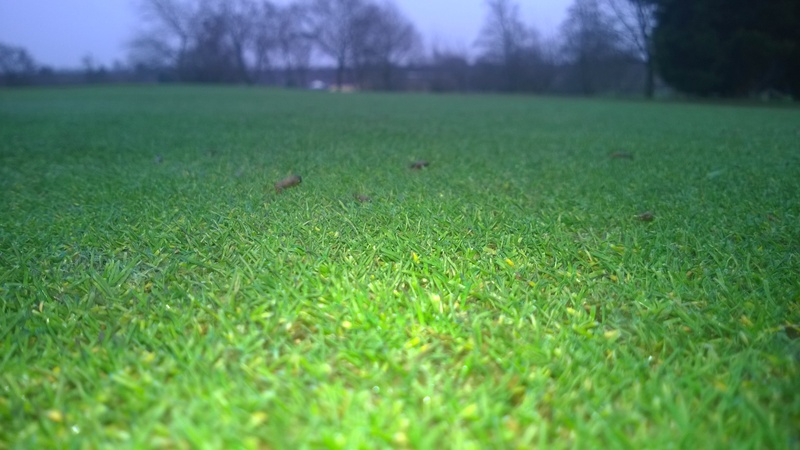 In December and January we’ve only been able to aerate 3 times due to weather being too wet (Dec 106.5mm, Jan 87+). We decided to try put small amounts of dressing on the greens in both months, this hasn’t been possible due to the weather, although we may have thought of a way to get round this by applying it with the walk behind spreader. The greens had a feed put on mid Dec, a 3-0-14 was applied. This got the greens looking really good, and there are still in decent shape. Another feed will be applied next week. We was hoping to apply some liquid iron mid Jan, this was not possible due to frost. Unfortunately due to the mainly mild winter we have had, fusarium has been present on quite a few of the putting surfaces. We have spot treated twice, due to not being able to get out with the big sprayer. We spotted new signs last Friday after the greens had thawed out, it was decided by Graham and I that we would come in and spray on the Sunday morning as the only window we had was then. We will be monitoring this throughout the rest of the winter. Liquid iron will now be applied mid Feb, this will help harden up the plant whilst also giving us good colour to the sward. Two application of a penetrant wetting agent have also been applied, we were of hoping to have applied one more by now but this hasn’t been possible. This will happen next week if the wind isn’t too strong. Rolling the greens stopped at the beginning of December due to the moisture levels becoming too high. We will start rolling the surface when conditions allow. As we speak we have dug and back filled two drainage areas on the 1st & 13th greens. 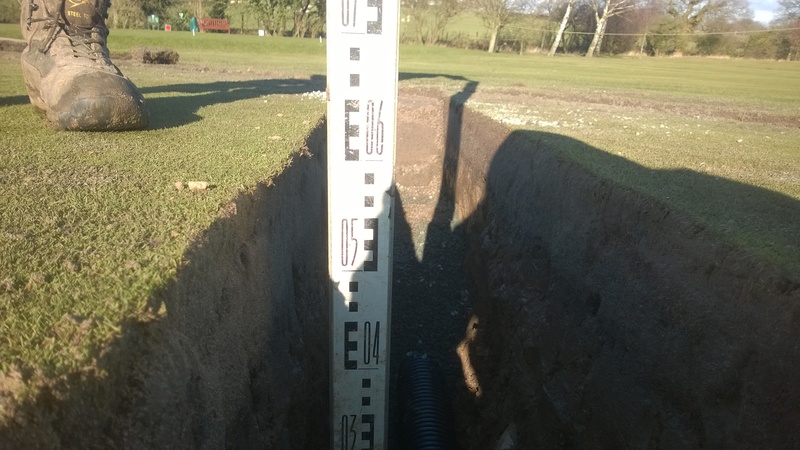 These were always problem areas so we have installed 100mm pipe at depths of 750-600mm. We have started to install a similar system to the 3rd green. We are also going to hopefully look into the problems on the 4th & 10th. 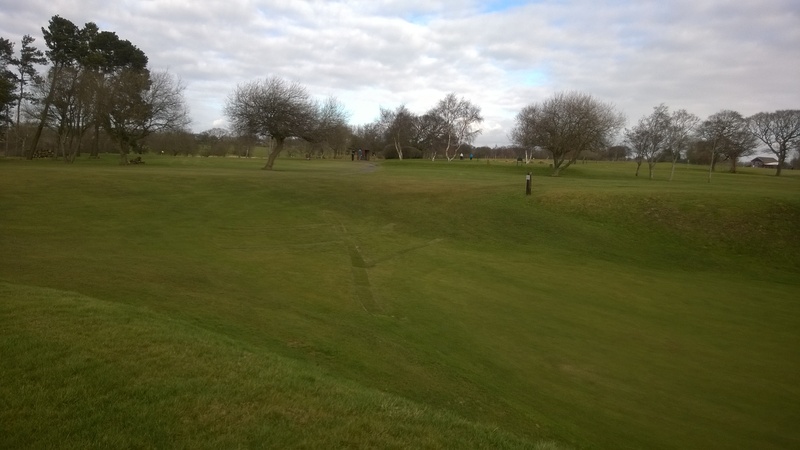 · Last verti- drain 7th followed by dressing. We may also micro core some wetter areas of the greens when we carry out the verti drain, areas like front 1st, front 3rd, left 4th, front 5th, front 6th, 10th etc. · Start summer wetting agent programme. All of the above is affected by weather, hopefully we will be able to complete all of the above, if not we prioritise the ‘must do’ tasks. Please follow us on twitter @ashtonleagreens , we give daily course reports and sometimes put pictures on of jobs we’ve completed. If you have any queries of any of the above please email us on greens-ashtonlea@hotmail.com. This is a 100mm perforated pipe, installed to the depth of 600-750mm. It’s been covered with 6mm stone up to 300mm of the surface, rootzone will then be used with new greens turf being laid. 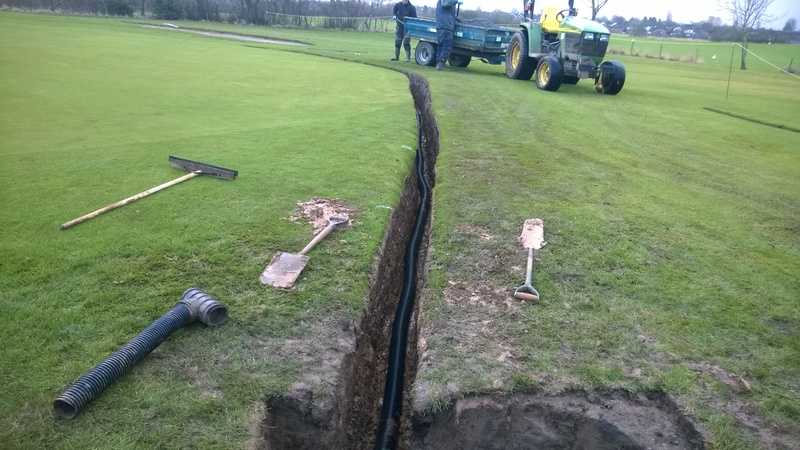 We feel this should solve the problem at the front of the green, we can always run more drains into this large drain in the future if needed. My plan is to install one main drain with 4 laterals running into it, this will hopefully catch the water before it gets onto the green, and also firm up the area. We are also going to shape the ground so it helps us direct the water where we want it to go, the main issue we will have on this job is the amount of fall. Unfortunately the drains in the greens are not that deep. The two other greens I am going to focus on are the areas on the 4th & 10th. On the 4th we will dig down on the problem area in the middle of the green exposing the drain that is there, replace the drainage stone, replace the rootzone and trim the turf of thatch. On the 10th the target areas will be the middle portions on either side. The plan is to bore down with a post borer as deep as it will go, backfill with stone then top up with rootzone, the turf will be re-laid with the majority of the thatch removed. I have plans to do a short term and long term report on the greens in the near future that I will email out, it will explain what has been done so far, and what we haven’t been able to do and why.